There are a lot of details that go into planning a big event. We know there will be a lot of questions through out this process so here are a few answers to get you started! What does it mean to have full service catering? Are there custom menu options available? Yes! If you are not seeing quite what you had in mind, please share your vision with Megan. Megan and the BTB culinary team would be happy to create a custom menu and bring your dreams to life. Is there an option for delivery catering? Yes, if you are looking for something a bit more casual, we do offer delivery catering. With this style of catering, we will setup all food and rentals provided by us at delivery. You will not have staff on site for additional setup, busing, replenishments, cake cutting, cleanup, etc. – this would be up to your friends and family. ​Will staff assist with cake cutting? Yes, this is included with our services, free of charge! If you are using our china/glassware/silverware rental, it will include the cake plates and forks. Are there any additional rentals available? Along with full service catering, we offer a wide range of table, chair and linen rentals. We bring everything with us day of, so you don’t have to worry about scheduling any deliveries! How does the menu pricing work? All stated menu pricing is per person, with the exception of hors d'oeuvres, which are per dozen. Pricing does not include staffing, rentals, tax or service charge. You will be able to see your total estimated catering costs once you send more information regarding your event to Megan de Farcy, your personal event specialist. If you missed her initial email with the menus and questionnaire, be sure to check your spam! Sometimes it can land there when it’s your first time chatting. How much will catering cost for 100 people? Event costs will vary upon your event details. Along with the style of the meal itself, additional details such as the bar, guest count, event times, location and more all contribute to the catering costs. We build custom proposals for all events to ensure all costs are quoted and covered upfront in order to assist with budgeting. The best way to get an accurate estimate for your event would be to send Megan a completed catering questionnaire. This is sent in the body of the introductory email containing our catering menus and other information. What are the bar options and pricing? Open Bar: You are charged per person - simply choose the bar package and number of hours and we take it from there! During open bar, guests will enjoy endless beer, wine and cocktails (if included in package). The price per person applies to guests 21 years+ ONLY. We offer endless sodas and juices for guests under 21 years old. Consumption Bar: You are charged per drink, with the option of pre-paying as much or as little as you want! This is a great option if you are expecting a lighter drinking crowd, or if you want to host some drinks before offering a cash bar. It is the perfect late night option too, if you want an open bar vibe all night, but don’t want to pay per person the entire night (let’s be real – not everyone makes it to midnight!). Any unpaid consumption balance is charged to the card on file following the event; if you pre-pay too much and it isn’t all consumed, we will refund you the difference! Cash Bar: Your guest pay for their own drinks. We bring all that you will need for the bar – the only cost to you is the bartender(s) and glassware! Be sure to check with your venue about this style bar; some venues do not allow cash bar. Bartender Only: Our experienced, TABC licensed bartenders pour alcohol provided by you! 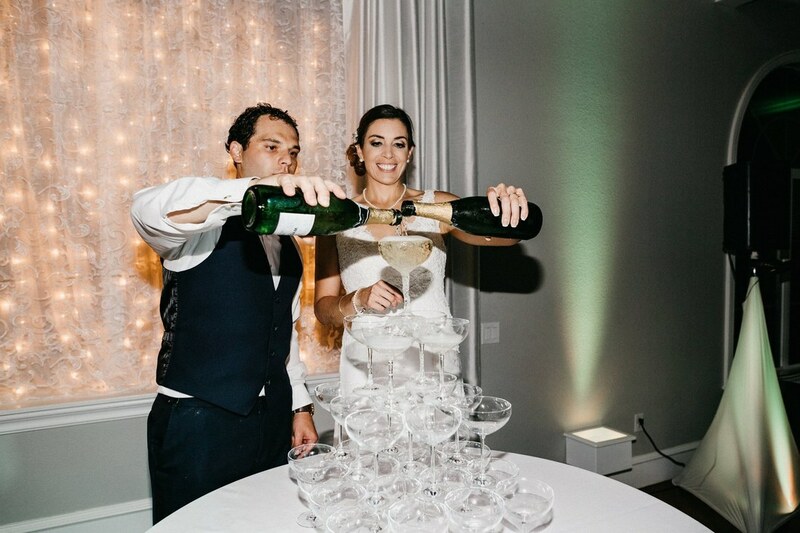 All booked full service events receive a complimentary tasting closer to their wedding day. Paid and complimentary tastings are available Wednesday and Thursday afternoons. Due to events, we are unable to offer tastings on weekends. Am I able to try the food before booking? A paid tasting with limited items: you try only a few items to get an idea of our food, and then get a full complimentary tasting closer to wedding day, after booking. How do I secure my event with Beyond the Box? In order to secure your event, we ask for a signed contract and 25% of the estimated event charges as deposit. ​A second payment of 25% is due 60 days prior to event day, and final payment is due two weeks prior to event day. If booking less than 60 days prior, 50% of event charges will be due as deposit. Does the menu finalize at the time of contract? You are welcome to make changes to your event after signing a contract. We don’t expect you to know every detail 6 – 12 months before your wedding day. A lot can change, and that’s okay! Throughout the planning process, Megan will work with you to slowly finalize details. Typically the menu will finalize at your complimentary tasting (approx. 60 days prior to event day), and rentals will finalize after the walk-through and final headcount. Final headcount is due two weeks before event day – it is at that time that all details finalize.